Yearlings to be offered at the 2015 Inglis Classic Summer Book have received opportune pedigree updates ahead of their arrival at Newmarket this week. Over 70 yearlings in the Classic Summer Book have had siblings win since the catalogue was released at the end of November. 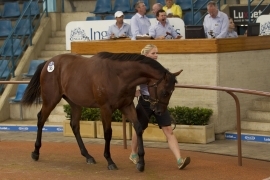 These pedigree updates are available at inglis.com.au and on the Inglis Sales iPad App. Some yearling drafts have already started arriving at Newmarket in preparation for parades starting on Tuesday morning, including Widden Stud (48 lots), Middlebrook Valley Lodge (14) and Bylong Park Thoroughbreds (2). 260 lots will be available for viewing by Tuesday afternoon and 501 yearlings by Thursday morning. All drafts will be parading on Friday afternoon and Saturday in the lead up to the start of the sale at 12 noon on Sunday 8 February 2015. CLICK HERE to view the entire arrival and parade schedule for the 2015 Inglis Classic Summer Book. CLICK HERE for the complete pedigree updates for the sale. 574 lots have been catalogued to start a new story from the 2015 Inglis Classic Summer Book on 8, 9 & 10 February. View the online catalogue at inglis.com.au , download it on the Inglis Sales iPad App or collect a hard-copy catalogue from reception at Newmarket during this week’s inspections.